“Local Firm Will Employ White Labor In The Future – Sidney Island Brick and Tile Company Resume Operation After Repairs to Plant Have Been Completed --- In the Future No More Chinamen Will Be Employed – The big plant of the Sidney Island Brick and Tile Company situated on Sidney Island about two miles east of the town, is once more in full operation after closing down for about a month in order to make a number of necessary repairs that could not be accomplished while the plant was in operation. Mr. Mitchell, the local manager, has been a very busy man during the past two or three weeks getting things in shape for the opening, and while in conversation with a representative of the Review this week gave out the statement that in future his firm would employ only white labor and Orientials would be entirely excluded. 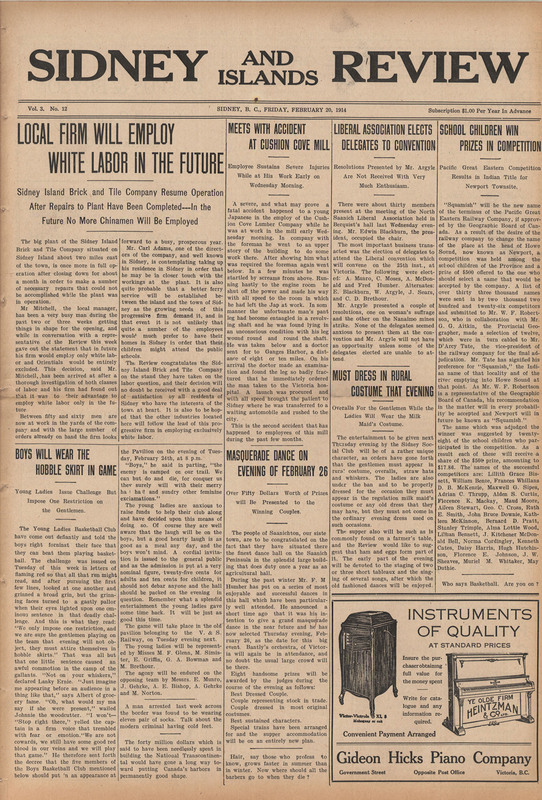 This decision, said Mr. Mitchell, has been arrived at after a thorough investigation of both classes of labor and his firm had found out that it was to their advantage to employ white labor only in the future. Between fifty and sixty men are now at work in the yards of the company and with the large number of orders already on hand the firm looks forward to a busy, prosperous year. Mr. Carl Adams, one of the directors of the company, and well known in Sidney, is contemplating taking up his residence in Sidney in order that he may be in closer touch with the workings at the plant. It is also quite probable that a better ferry service will be established between the island and the town of Sidney as the growing needs of this progressive firm demand it, and in that event it is not unlikely that quite a number of the employees would much prefer to have their homes in Sidney in order that their children might attend the public schools.